TBack in late 2011, I amused myself for a time tracking the reports in which various well-known agencies pointed out the flaws in subsidizing biofuels. a June 2011 post, "Everyone Hates Biofuels," I pointed out a report in which 10 international agencies made an unambiguous proposal that high-income countries drop their subsidies for biofuels. I followed up with "The Committee on World Food Security Hates Biofuels" in August 2011 and "More on Hating Biofuels: The National Research Council" in October 2011. But of all the problems with subsidizing the production of ethanol from corn--the cost, the distortions in price of farmland, the lack of any reductions in carbon dioxide emissions, and others--clearly the most serious problem is that that it is causing people in low-income countries to go hungry. 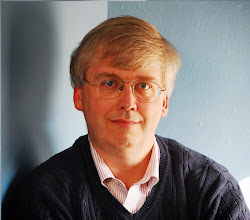 Timothy A. Wise lays out "The Cost to Developing Countries of U.S. Corn Ethanol Expansion" in a working paper published in October 2012 by the Global Development and Environment Institute at Tufts University. The article offers a lot more detail, but the basic outline is simple enough. 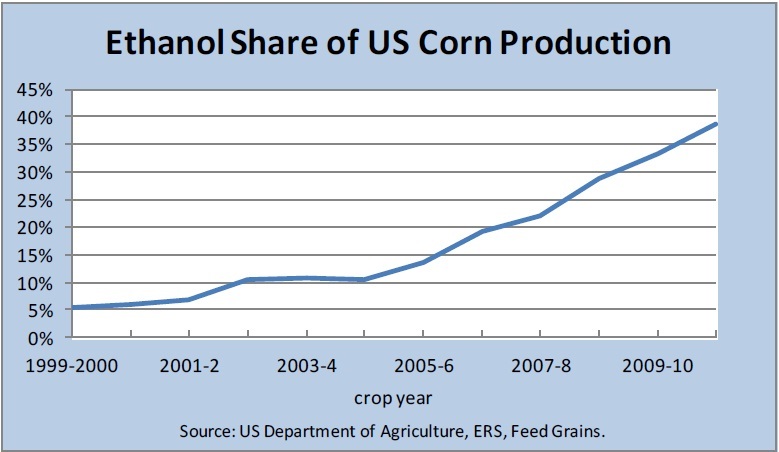 Primarily because of government subsidies, the share of the U.S. corn crop going to produce ethanol has risen dramatically in the last few years, up to about 40%. 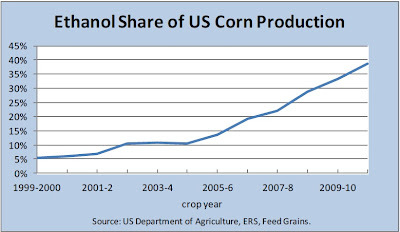 There are number of reasons why global prices for corn have gone sky-high in the last few years, like the drought in summer 2012 that cut the U.S. corn harvest, but one of the major factors is clearly that government subsidies are diverting large share of corn production into ethanol. 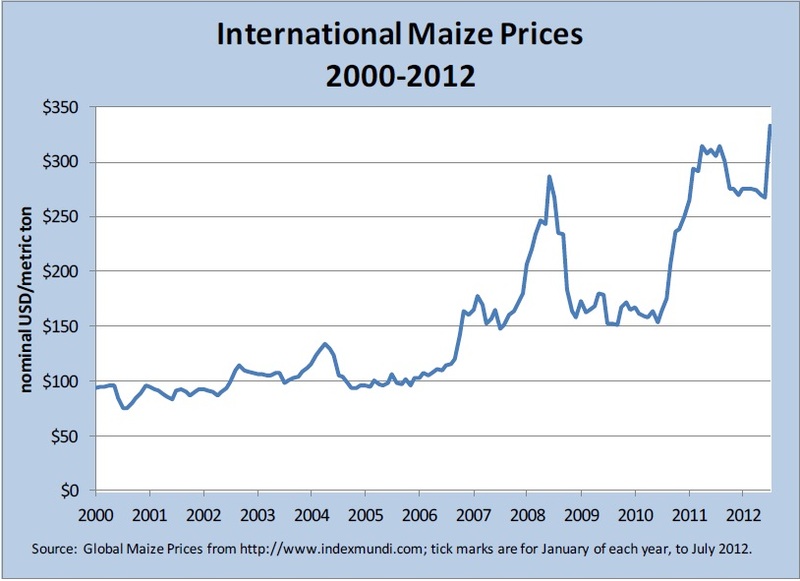 Here's a graph of global corn ("maize") prices. 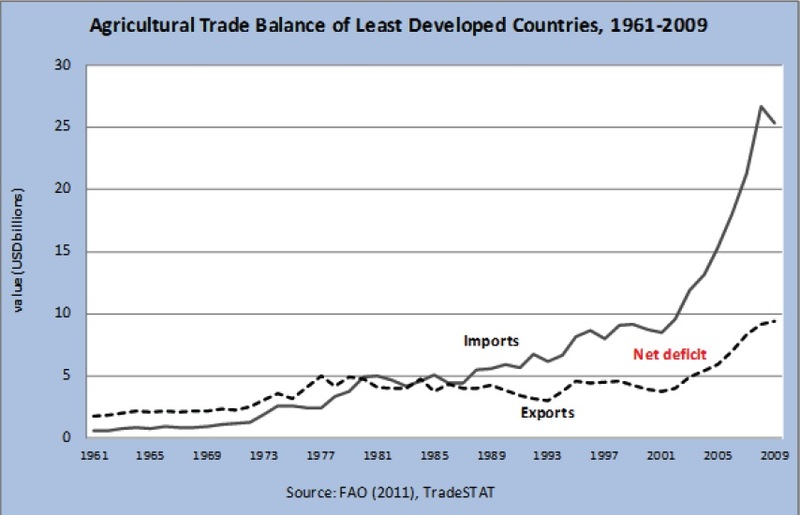 agricultural imports while reducing their own domestic support for farmers. The result: a flood of cheap and often-subsidized imports from rich countries forcing local farmers out of business and off the land." 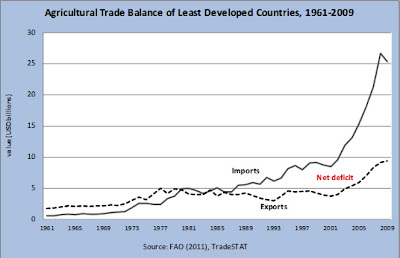 Here's a figure showing how the agricultural trade balance for low-income countries has evolved. Wise estimates: "Using conservative estimates from a study on ethanol and corn prices, we find that from 2006-2011 U.S. ethanol expansion cost net corn importing countries worldwide $11.6 billion in higher corn prices with more than half of that cost, $6.6 billion, borne by developing countries." 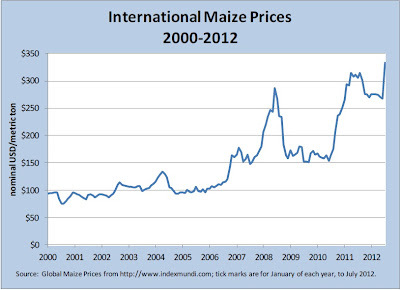 Of course, the high prices for corn hit the pocketbooks of low-income people in low-income countries the hardest. It's been clear for awhile now that subsidizing the production of corn-based ethanol was primarily a subsidy that flowed to large agri-business concerns that grow and process most of the corn in the United States. These subsidies aren't just a costly and ineffective way of pursuing lower energy imports and reduced carbon emissions--they are also causing higher food prices and hunger for some of the poorest people in the world. They should be stopped.